The symbol for nickel is Ni and it is a transition metal. Its atomic number is 28 and its atomic mass is 58.69. There are 28 protons, 31 neutrons, and 28 electrons in this element. The word nickel comes from the German word Kupfernickel. Kupfer means copper and the term nickel in German referred to Satan or the devil. Baron Axel Fredrik Cronstedt discovered Nickel in 1751 while trying to extract copper from the mineral kupfernickel. The earth's core is made up of 5.5% nickel and the crust is made up of 0.0068% nickel. 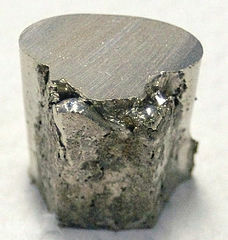 Pure nickel is rarely found on Earth. Approximately 30% of the world's nickel is found in Sudbury, Ontario, Canada and is mined from an asteroid that crashed into the Earth millions of years ago. Nickel does not react with air under uncontrolled atmospheric and weather conditions. Finely divided nickel metal reacts readily with air and in this form may easily ignite. At higher temperatures, the reaction between nickel metal and oxygen appears not to proceed to completion but gives some nickel(II) oxide. Nickel does not react with water under normal conditions but can with changing temperatures. Nickel dissolves slowly in dilute sulphuric acid to form solutions containing the aquated Ni(II) ion together with hydrogen gas, H2. Nickel does not react with aquaous sodium hydroxide. Check out this video of a very hot Nickel ball reacting with hot water. Nickel forms compounds such as hydrides, fluorides, chlorides, bromides, iodides, oxides, sulfides, selenides, tellurides, nitrides, and carbonyles. Meteorites contain both iron and nickel, and earlier ages used them as a superior form of iron. Because the metal did not rust, it was regarded by the natives of Peru as a kind of silver. A zinc-nickel alloy called pai-t’ung (white copper) was in use in China as long ago as 200 BC. Nickel can be a skin allergen in some people and can also cause cancer if the dust of some nickel compounds is inhaled. Another interesting fact is that even at high temperatures the metal holds its form and is used in gas turbines and rocket engines. The melting point of nickel is 2647 degrees Fahrenheit. Other common uses include the wire used in electric toasters and heaters which is an an alloy of nickel and chrome and as a plating to protect the surfaces of many metals. It is often added to steel to make the "shiny" parts for automobiles. We also consume nickel in our diet through whole grains and vegetables. It is extensively used for making stainless steel and other corrosion-resistant alloys such as Invar(R), Monel(R), which is used in rechargeable batteries, Inconel(R), and the Hastelloys(R). Tubing made of copper-nickel alloy is extensively used in making desalination plants for converting sea water into fresh water. Nickel is a silvery white metal and is approximately 25% of the 5 cent coin which is where the coin gets its name. Nickel steel is used for armor plates and burglar-proof vaults, and is also a component in Nichrome(R), Permalloy(R), and constantan. Nickel gives glass a greenish color and finely divided nickel is a catalyst for hydrogenating vegetable oils. It is also used in ceramics, in the manufacture of Alnico magnets, and in the Edison(R) storage battery. Readers Digest Illustrated Encyclopedic Dictionary, Volume 2 l-P, The Readers Digest Association, Inc. Pleasantville, New York, Montreal. "Abundance in Earth's Crust of the Elements." Abundance in Earth's Crust for All the Elements in the Periodic Table. N.P., N.D. Web. 29 Oct. 2015. "Nickel: Compounds Information." Nickel»Compounds Information [WebElements Periodic Table]. N.P., N.D. Web. 29 Oct. 2015. "Nickel Facts." Nickel Facts. N.P., N.D. Web. 29 Oct. 2015. "Periodic Table of Elements: Los Alamos National Laboratory." Periodic Table of Elements: Los Alamos National Laboratory. N.P., N.D. Web. 29 Oct. 2015. Parsons, Paul, and Gail Dixon. “Nickel.” The Periodic Table: A Visual Guide to the Elements. New York: Quercus, 2014. 72-73. Miller, Ron. The Elements: What You Really Want to Know. Minneapolis, MN: Twenty-First Century, 2006. 81-82. Green, Dan. The Elements: The Building Blocks of the Universe. New York, NY: Scholastic, 2012. 17, 46, 48.